This photo is created from two of my pictures. I felt the photos by their selves did not jump out. They were the typical bird and flower pictures. I wanted a picture that shows a story. This photo of a big hibiscus flower and a little yellow bird showed me a beautiful red bird- house with a yellow perch. The tiny warbler with its open mouth appears to call into the flower. 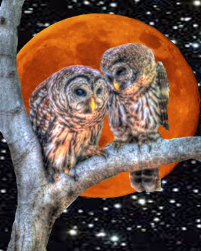 This is a piece of digital art I did of a parent owl and its young with a harvest moon surrounded by a starry night. The young owl on the right waited over an hour for its parent to return. When the parent returned, the young owl showed its love and joy as it nestled against the parent.